Adam Hunter and Ali Jackson, the box-owners of Crossfit Don Valley, are giving us a little insight into what happens at their BOX! Enjoy another episode of our Europewide BOX interviews. How did you come to CrossFit? Adam: Whilst working as a personal trainer I read an article about ‘The Fittest Man On Earth’ naturally I was intrigued and tried one of the workouts that was described. It crushed me. From then on CrossFit has been my passion. 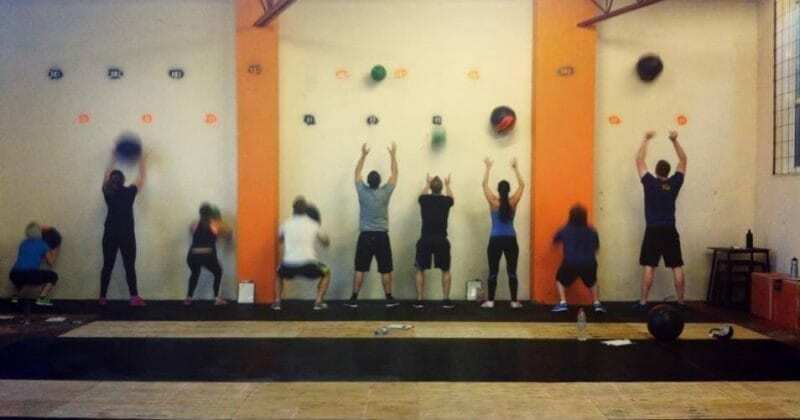 Ali: I came across CrossFit while on a mission to lose some unwanted weight, but getting bored of the local ‘globo gym’ and just wanting that something different, something that would push me that little bit harder. From day one I was totally hooked. Why did you open your own box? Adam: Simply put it has always been my dream! I always wanted a gym of my own and after finding CrossFit it was the natural direction to follow. Ali: I met Adam through CrossFit, and we became good friends through training together pretty much daily. So with our sharing the love of CrossFit, alongside his ambition of wanting to open his own gym, getting together to do this, to build and grow our own little community became the obvious thing to do. Why exactly should I join YOUR box? What makes it standout from others? Aswell as regular CrossFit classes we also run Strongman sessions which give people a chance to use different equipment like stones, logs and kegs. They love it, especially the ladies! We also have a really strong yet relaxed and friendly community already which is great to say we are so young. At the moment we have around 30 members and this is growing constantly. We have a very wide variety of people who train with us, from potential Olympic Games athletes, Taekwondo champions and full time mums. We have a few competive athletes, both in CrossFit and in their chosen sports. Its great to see everyone working out together and pushing each other! Do you have additional training possibilities (Yoga, Gymnastics etc.)? As well as the CrossFit and Strongman classes we also run multiple Olympic lifting classes every week for those wishing to further their skills. We also run a Mobility Class on the weekends. In the New Year we will be looking forward to putting extra classes on the timetable such as Kettlebells and Gymnastics Focus classes. Watch this space! Do you consult your members in nutrition questions? Both coaches offer Nutritional Advice if required, we are also planning on running some nutrition seminars in the near future to give people further insight into good clean eating and sports nutrition. If I start as a beginner – how does my training in the first month look like? We run a weekly taster class on a Saturday at 12.30, it’s completely free and open to anyone. This gives people a chance to join in with their friends and experience what a class is like. The next step is to book an intro class with one of our coaches, in this 90 minute session we will take you through the basics of what we do, we use this to see what we need to work on, if there are any mobility issues or movements you struggle with. After completing this session you may join in with the classes. We always break everything down before each workout so no need to worry if you forget anything from the intro. Do you organize any internal or open competitions? At the moment we don’t but it is something we really want to look into in the near future. Do you have links to other boxes? We both have friends in nearby and distant boxes which we keep in contact with and who pop down for a workout with us regularly. Can I drop in if I am passing your city? Who do I have to contact? Ofcourse! All we ask is you let us know you are coming so we can book you on and make sure there is space, we run a booking system and limit our class sizes to 12 people to ensure there is enough equipment and space for everyone to work out safely and effectively. You want to see your box featured here? Get in touch!